Identify the symptoms. Make a diagnosis. Begin the appropriate treatment. If there’s anything I learned from my folks who practice medicine, it’s that resolving health issues revolves around these three things. Whatever it may be, keep calm. There’s a remedy for that. In the grand scheme of things, “improving the quality of life” as my father likes to call it, the same precept applies. Acknowledge the signs, call a spade a spade and be proactive about your resolution. Toss mental health into the picture and that’s when things get tricky. Unlike signs you can flat-out see or descriptors derived from simple observation, mental health is invisible. It does not physically manifest (not directly, at least). Jumping back to physical health: a wound, for instance, is a wound to anyone with a pair of eyes. A bruise is a bruise. A 39-degree read on a thermometer is a high-grade fever. Charts. Numbers. Tell-tale signs. Quantifiable. Tangible. Easy to read. Sometimes just as easy to interpret. When it comes to matters of the mind, the status quo is to play it cool. Shake it off. Cast overwhelming thoughts into your mind’s figurative recycling bin, hit right click and select “empty trash.” But a lot of the time, especially when it builds, mental overload feels a lot more like a whole-body experience. It’s a cloud above your head, a boulder on your shoulders, a 50-pound weight over your heart. Still, it’s off-putting to make a fuss out of something you cannot prove to anyone other than yourself. It’s all in your head, after all. As a positive thinker who tries to pull an Eat, Pray, Love whenever she can and “learn to select thoughts just the same way you select your clothes every day,” I admit I am in no way exempt from the overload: the almost paralyzing feeling of, ironically, being constantly on the move. To me, feeling your already diminishing energy further dwindle isn’t new. Being disconcerted by the realization that you are exerting more energy than you are regenerating isn’t new either (cue: further anxiety). I am not exempt from the discomfort that comes with knowing but not knowing as far as mental wellbeing is concerned: knowing full well that something’s amiss and something’s giving in but not knowing what the hell to do with this information. Now, in the spirit of the true meaning of self-care, it’s high time we rid ourselves of trial-and-error ways and figurative band-aids. Next time you feel you’re on the brink of overcapacity, try these straightforward but effective exercises that the mentally drained folks that came before us swear by: the easy-to-follow everyday symptom-diagnosis-treatment routine for a lighter mental load. #1. Acknowledge that it is unrealistic to be at 100% all the time. But it’s also your body’s way of telling you to slow down, so listen. The moment you start to feel like you’re running on reserve, be more selective about what you dedicate your energy to. Not all stimuli will need your time, attention or reaction; don’t allow the non-essentials chip away at your precious energy. Crossing over to the physical how-to in this stage: when you can, grab a pick-me-up. Oatmeal, coffee, bananas, sweet potatoes and green tea are some of the more popular and readily available energy boosters you can pick from. The important thing about this self-assessment stage is it allows you to come to terms with the fact that, hey, you are only human. No one is expecting you to function like a machine, therefore this is one expectation you shouldn’t set for yourself. The moment you stop beating yourself up over this, the better you’ll feel. Sometimes, you’re your own cloud hovering overhead. #2: Distance yourself from the source of your mental unrest. Pry yourself out of autopilot mode and actively remove yourself from the setting that burned you out in the first place. You can’t expect to build yourself back up again in the same environment that broke you down. Go for a walk. Buckle down in a coffee shop instead of your office cubicle. While you’ve temporarily escaped your usual bubble (and since you only ever get to see the big picture from a distance), take this opportunity to list down your triggers. When was the last time you felt mentally strained? What was the setting? Who or what kind of language used by that person who prompted it? Doing this allows you to identify what to sidestep the next time. #3: Create a list of your small wins. Because small wins in life are real wins, too. The catch is: they’re usually overlooked given the pressure to “go big or go home.” The “out of sight, out of mind” premise doesn’t help the cause either. When you don’t see the positive right in front of you, it’s a lot easier to let the negative in your head take up the reins. Good feedback during your last report? Write it down. Finished a task ahead of time? Write it down. Stumbled across the best burger of your life at an unassuming restaurant over lunch? Write it down. There are a lot of things to be grateful for. They just can’t be properly appreciated when kept in a mental note. #4: Request for a mental health day. First, find out if your company is accustomed to providing mental health days. While a company that doesn’t value your mental health as their employee certainly raises red flags, rephrasing “mental health day” for more traditional settings may be crucial for the sake of communication (hello, offset). The hope is that your current company is caught up on the importance of this kind of day off and will be more than happy to give it to you so you can re-center. But when is the best time to do so? Here are some sound reasons for requesting a mental health day: when you need to show up to an appointment precisely for your mental wellbeing, when you’ve had a continuous string of workdays with extended overtime and need to recuperate or when urgent personal issues need addressing. #5: When you get back into the grind, approach time management using Steven Covey’s matrix. 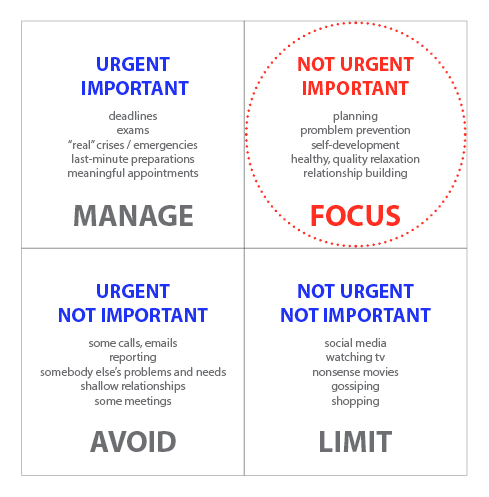 The goal in order to better use your time and energy and, in the long-run, achieve your long-term goals, is to focus on the second quadrant: non-urgent, but important matters. #6: Repeat after me: “later” can wait. Lao Tzu once said: “If you are depressed you are living in the past. If you are anxious you are living in the future. If you are at peace you are living in the present.” As difficult as it is not to calculate your next move for fear of being left behind in the game, stop. For your mental health, stop…because the secret actually lies in the process of taking away, not only to lighten the mental load, but in order to gain more of the good and be more. Take away the counterproductive habit of multi-tasking and focus on only one thing. Block out the unnecessary noise and learn to enjoy silence when it’s granted to you. In other words, simplify.